PharmaGABA® is an innovative formulation containing gamma-aminobutyric acid, or GABA, as it’s more commonly known. This neurotransmitter is recognised for its calming, anxiolytic effects in the body and is thus available in nutritional supplement form for fighting stress and anxiety. While a number of dietary supplements are formulated from synthetic GABA, PharmaGABA® offers a natural alternative. This new stress-fighting supplement contains natural GABA obtained from Lactobacillus hilgardii, a bacteria used for fermenting vegetables. This unique formulation process produces a form of GABA with excellent bioavailability in the body. 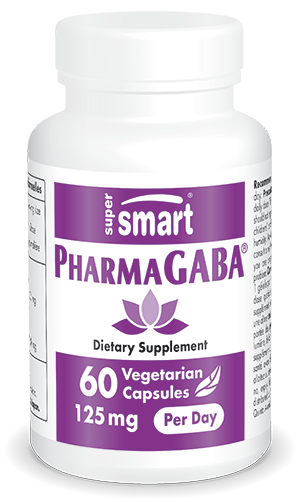 With its content in natural, bioavailable GABA, PharmaGABA® offers a way of obtaining the benefits of this neurotransmitter. Gamma-aminobutyric acid is the body’s main inhibitory neurotransmitter, helping to regulate neuron activity by reducing neuronal excitability and preventing prolonged over-excitation. GABA’s neuron-modulating role is essential for inducing a state of physical and mental relaxation. In other words, GABA acts as both as powerful anxiolytic and a natural stress-buster. While neuronal excitation is essential in certain situations, prolonged over-excitation can be damaging to health, leading to problems with sleep, behaviour and mood, as well as increased blood pressure (hypertension). These symptoms are typical of a state of stress or anxiety. In the nervous system, this manifests as an imbalance between excitatory neurotransmitters such as acetylcholine, and inhibitory neurotransmitters such as GABA. PharmaGABA® has been developed specifically to maintain or restore such balance. In delivering natural GABA, this new dietary supplement helps relax the body and reduce the many negative effects of stress and anxiety. Adhering to high quality standards, PharmaGABA® has seen rapid growth in demand, particularly in Japan. Both in nutritional supplements and as a functional drink ingredient, it is popular with Japanese people for reducing stress and inducing a state of relaxation. This innovative formulation provides 125mg of natural GABA per capsule, with a suggested dose of one capsule a day, although this can be adapted to your needs and the advice of your therapist. You may also be interested in other supplements that help combat stress and maintain general well-being. N-acetyl L-tyrosine and 5-hydroxytryptophan (5-HTP) , for example, are two amino acid derivatives which can be converted in the body into various neurotransmitters such as noradrenaline, dopamine and serotonin. The latter two are so-called ‘happiness hormones’, while noradrenaline acts as a natural brain stimulant.